Reference number for this case: Oct-Nov-54-Beuzeville-la-Guérard. Thank you for including this reference number in any correspondence with me regarding this case. Local ufologist Christian Soudet wrote an investigation report for this case published in the ufology magazine Lumières Dans La Nuit #259-260 of January - February 1986. The witnesses were Mrs. Micheline Deschamps, with whom Christian Soudet had an interview on September 4, 1984, her mother who has since died, and neighbors who have since passed away. The case took place in October or November 1954, at nightfall around 07:30 p.m.. The sky was clear and there was no wind. The place is in Beuzeville-la-Guérard in the direction of Thiouville, at a hill at a place called "Les Arbres Hauts" on the Departmental Road 50. The witness stated: "My mother and I were returning from shopping in Ourville-en-Caux and we were going towards Thiouville, we were walking up a hill with our bicycles at our hands. Suddenly our attention was drawn to bright light on the left side. The light was violent and seemed to be jolting, it illuminated the underside of a dull metal object (Pantone 410 U) I could not see the top of the object; which was hidden by the foliage of the trees. The object emitted a violent light as well as an acute and annoying whistling sound." "The object moved parallel to us and came out of the row of trees, we were now observing it entirely. It was shaped like a lampshade, and it took the direction of Cliponville quite quickly, we then we could see a dark mass with lights in the sky, it went away and we saw only one bright spot and then nothing, we went back on our bicycle and rushed to get back, we did not wish to see that object again." 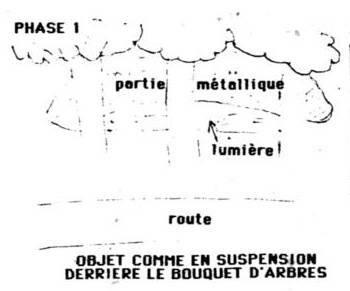 Christian Soudet noted that the object moved very quickly at a steady speed that Mrs. Deschamps could not assess, and was going in a North to South direction. The object was about the size of an automobile, was about six meters above the ground and ten meters away from witnesses who felt nothing physically during the observation of about five minutes. Christian Soudet noted that Mr. and Mrs. Deschamps were very nice people with whom he had met on May 3, 1984, in Fécamp at the conference of ufologist J.-C. Bourret. He published two sketches of the object, visible below in this file. Witnesses: Mrs Micheline Deschamps, her mother (deceased), neighbors (deceased). Time: at night fall, approximately 07:30 P.M.. Weather: clear skies, no wind. Location: Beuzeville-la-Guérard in the direction to Thiouville, in a hillside at the location "Les arbres hauts". Departmental road 50. Michelin map N.52. Observed phenomenon: Observation of an object in the shape of a cone of metallic appearance with above, sharp lights, moving. (Interview on 09/04/84). My mother and I were returning from shopping in Ourville-en-Caux and we directed ourselves towards Thiouville. We climbed a hillside by foot holding our bicycles with the hands. Suddenly our attention was drawn by a sharp light on the left side. The light was violent and seemed to make jolts. It lit the lower part of an object of dull metallic appearance (Pantone 410 U). I did not see the top of the object which was hidden by the foliage of the trees. The object emitted a violent light as well as an acute and annoying whistle. The object moved parallel to us and came out of the curtain of trees, we now observed it entirely. It had the shape of a lamp-shade; and it took the direction of Cliponville rather quickly, we then distinguished a dark mass with lights in the sky. It moved away and we saw only one luminous point then nothing anymore. We went up on our bicycle hastening to return, we did not want by no means to see the object again. Mr. and Mrs. Deschamps are very sympathetic people which we learned to know on 05/03/84 in Fécamp at the time of the [UFO] conference by J.-C. Bourret. the observation lasted approximately five minutes. Luc Chastan indicates in his database that in the Seine Maritime in "Beuzeville la Guerard in October 1954" at 19:30 hours, "a woman and her daughter return by bicycle from shopping in Ourville in Caux. They ride in direction of Thiouville and are at a hill at the location "Les Arbres Hauts" on D50. They put foot at the ground to climb the hill when they observe a sharp light on their left. The light is violent and seems to make jolts. It came from the lower part an object of dull metal appearance whose top was hidden by the foliage of the trees. The object also emitted a high-pitched whistling sound. The object moved at a regular speed but fast and thus it came out of behind the trees. It was in the form of a cone, the size of a car moving within six meters of the ground and ten meters of the witnesses. The object left quickly in the direction of Cliponville. Total duration of the observation 5 minutes." I do not have any certainty on this observation, but there is the possibility that it was a helicopter; at least the overall shape and the noise suggest this. 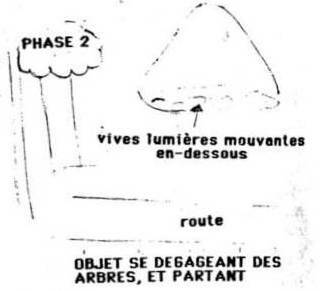 [cs1] Report by Christian Soudet, in the ufology magazine Lumières Dans La Nuit (LDLN), France, #259-260, page 26, January / February 1986. 1.0 Patrick Gross June 2, 2009 Conversion from HTML to XHTML Strict. First formal version. Addition [lc1]. 1.1 Patrick Gross December 6, 2018 Additions [lh1], Summary. Explanations changed, were "Not looked for yet."